Mags: "Guess what this is, Mama?" Me: (breaking into a sweat) "Umm...let me see. A platypus?" Me: (heart racing) "I could have sworn it looked like Perry. Can you give me a clue?" Mags: "Nope. It's not Perry." Me: "I need a clue, please." Mags: "I just gave you one...hello...it's not Perry." Mags: "Well...he's PLAID. And he's in a book we read at school." Mags: (long, dramatic sigh) "Okay. I'll give you a pass on this one cause those big kids you teach have been testing your brain." Tuck: You know what I'm asking Santa for this year?" Tuck: "Over here in this aisle. I'll show you." Tuck: "Yep. Look! You make your OWN soda. See all the different flavors?" Tuck: "You know why else I want it...besides the Root beer? It's good for the Earth cause it uses the same bottle every time. I bet Santa will like that." Me: "You know, Santa probably is into reduce, reuse and recycle. He does have the Island of Misfit Toys, after all. They're reused toys. Get it?" Tuck: "Good call, Mama! Remind me to put that in my letter." And then, just a few days later, Christmas came early for my little man...and the whole family, really. Remember how Michele and I went to BlogHer13 this summer? 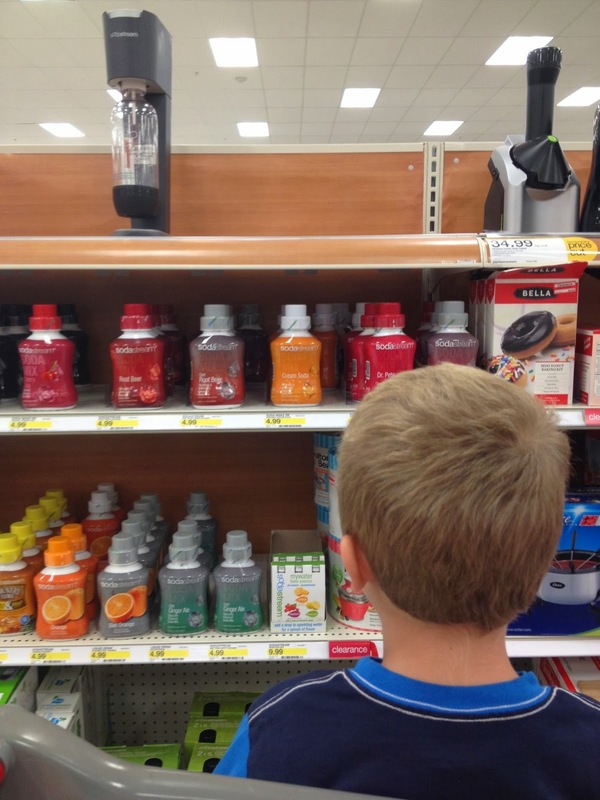 Well, along with other vendors, we got to meet and spend some time learning about the SodaStream products. The words, 'simple to use' and 'eco-friendly' caught our attention immediately. Never mind the bottomless cups of delicious concoctions they had at the booth. I believe we tried about five of their flavors in a matter of ten minutes. And the woman who was working the SodaStream maker was also demonstrating how fast you could make a Liter of soda, soda pop, pop or tonic...depending on how Southern or Northern you are. After the flurry of paper filler and bubble wrap was unloaded, we found the machine and soda mixes inside. It took us all of 10 minutes to get it set up, figured out and our first Liter of soda made. We had a BLAST going through all the different sampling of flavors they sent us. Hands down, Root beer and Cola were the family favorites, but I also enjoyed the Pear and Black Current mix. There are so many affordable choices, we really can't wait to try all their flavors. There truly is a flavor for everyone. And speaking of flavors, SodaStream posted these interesting details about the mixes on their site, "Regular Sodamix flavors contain less sugar, calories, carbohydrates and sodium than national drink brands. Regular flavors contain no high-fructose corn syrup, and are sweetened with a blend of sugar and sucralose. Diet Sodamix flavors contain no sugar, no aspartame and are sweetened with Splenda® brand sweetener. Sparkling Naturals are sweetened exclusively with cane sugar." Below is just a small sampling of their 60+ flavors that are sold on the SodaStream site and at select retail stores such as Target for $5-7 a bottle. Did I mention that one bottle makes about 50 servings? Michele used the other half of our collective brain to figure out that it came to about 10-14 cents a glass. PLUS, when you are finished with the flavor bottle, that is ONE 16.9oz bottle in the recycling bin rather than FIFTY 7.5oz cans. Go on with your bad self, Soda Stream! WAIT! There's more! You can have your very own SodaStream taste test because Michele and I are EACH giving ONE away. Good luck! Please feel free to share the love to earn more entries! The giveaway will close on October 1st at Midnight EST. *Please note that both winners will need a continental US shipping address. Mags: "You sound like Snuffleupagus, Mama." Me: "I know. I'm stuffy and have a bad headache." Mags: "At least you don't LOOK like Snuffleupaugus. That would make you feel worser." One full school week. Five "business days." Monday through Friday. Three "A" days and two "B" days in a high school block schedule. That's exactly how long it took me to get sick once the school year began. On top of that was also sending my own children back to school; my daughter going for the first time to full-day kindergarten. Never mind the after school activities that began in full force. Like everyone else out there, it became a sprint straight out of the gate. I left my immune system in the dust, coughing and choking wondering what the heck just happened. But a week? Really? With the stuffiness (or Snuffy-ness) came the headache from H-E-double hockey sticks. I quickly text Michele in between each of us taking a few breaths. We both were able to empathize with each other's craziness and ailments that were the results of it. Lucky for us, we met a company at BlogHer13 called Boiron. Boiron is a company that is a world leader in Homeopathic Medicines. You may know them for their well known product that Michele and I would dare you to say three times fast, Oscillococcinum®, that provides relief for flu like symptoms. In fact, at BlogHer13, we dared the poor woman who was at the booth to do just that. And she did it...without skipping a beat. The thing is, I had never heard about this company past that medicine that tongue tied me in CVS. But, guess what? They have a website that will knock your socks off...at least it did mine. When you visit the Boiron site, they have so much to offer beyond relieving flu symptoms and cough. They have blue vials full of homeopathic goodness that offer relief for things such as allergies, digestive issues, headaches, joint and muscle pain, oral care, stress, sleep and women issues. You can locate a store near you to purchase their products. Over the past few weeks, with lots of changes going on in our house, the headache has reared its ugly head almost daily. Immediately, I made a change. I doubled my intake of water. Hydration makes a huge difference. I also tried something new. Boiron sent me some of their homeopathic "blue vials" that targeted relief in headaches above the eyes. Since I have been having those frequently for over a year now, I decided to give it a shot. I've combined the "single medicines" from Boiron's line for headache relief with my new hydration routine and have seen some improvement. The pain seemed to be kept at bay throughout this week. But, I noticed something else about my stuffy nose. The pressure and congestion was relieved in only a few days (which of course helped the head pain). I was actually pleasantly surprised. Now, if I could just fall asleep...and stay asleep...that would be fantastic. Oh! It seems I'm in luck because Boiron also have something for that, too. I'm hoping to try it soon. VERY soon! So, since cold and flu season is moving in faster than the frost warnings, we have a special treat for you. Michele and I are giving away a gift pack from Boiron including their products, Oscillo, Chestal cough syrup and Arnicare, plus coupons and an Easy Guide to Homeopathic Medicines. Simply enter in the Rafflecopter below for a chance to win. Good luck! you cough or sneeze. And wash your hands frequently. Me: "What's the deal with the popcorn kernels in the Bubba Gump glass?" Chris: "I can't tell you." Me: "Seriously? It's taking up space on the counter. Can we at least move it?" Chris: "No. I need it right there. It's not hurting anything. It's just a collection of mine." Me: "Fine. I won't move it if you tell me why you're collecting the kernels." Chris: "If you think hard enough, you'll be able to figure out why." Me: "I'm afraid to even try." Alright my friends. I need your help. See the glass below? The one filled with popcorn kernels and the picture of a smug little shrimp on the front of it. Just look at him smirking at me. HE knows why Chris is keeping this glass full of popcorn. Of course, this has become an unspoken game of wits in our home. I hide the glass somewhere in the house. It's gone off the counter for a day or so. But, like a boomerang, it ends up right back on the counter again after Chris discovers where it is. the shirt that reads "RIP Pluto." Why do you think my husband is collecting popcorn kernels? Mags: "What are all these lines when you smile?" Mags: "Will I have those when I'm your age?" Me: "Maybe. Everybody is different. 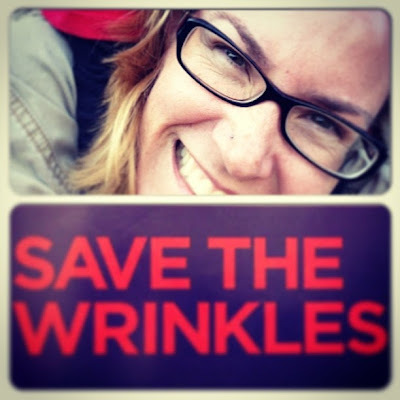 But when you get older, you'll start to get some wrinkles." Mags: "Oh no. Not me. I'll find an app to fix that." If only. 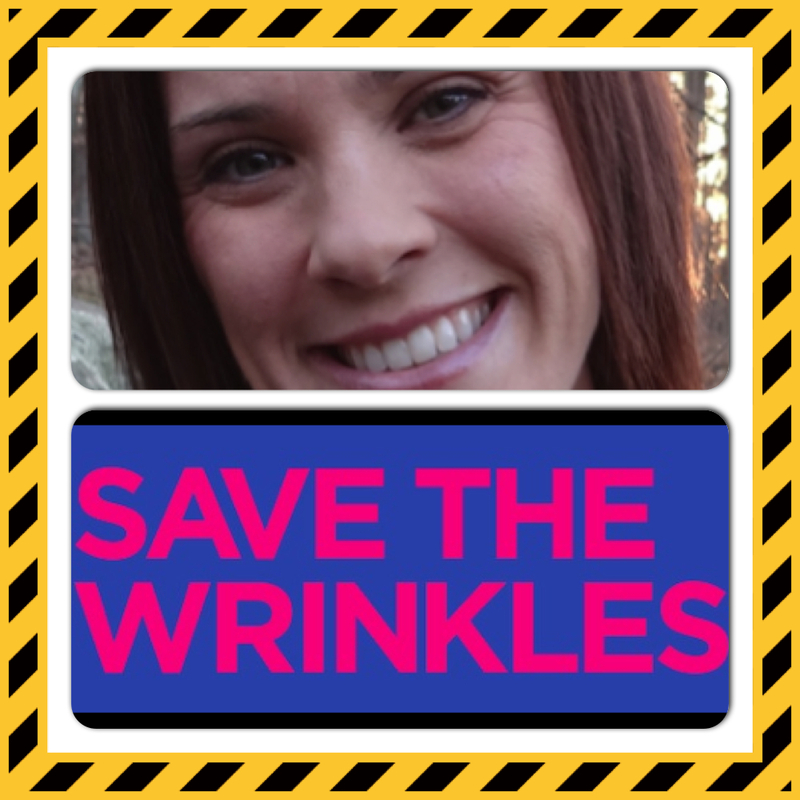 If only there was an app to wipe away my wrinkles that seem to grow deeper with each passing day. My "crow's-feet" are more like "pterodactyl-feet." As time marches forward, so do the lines around my eyes, my mouth and my neck. My friend, Deb. Freelance writer extraordinaire. You'll want to find her on Facebook! second week as a high school teacher. Life is happening. 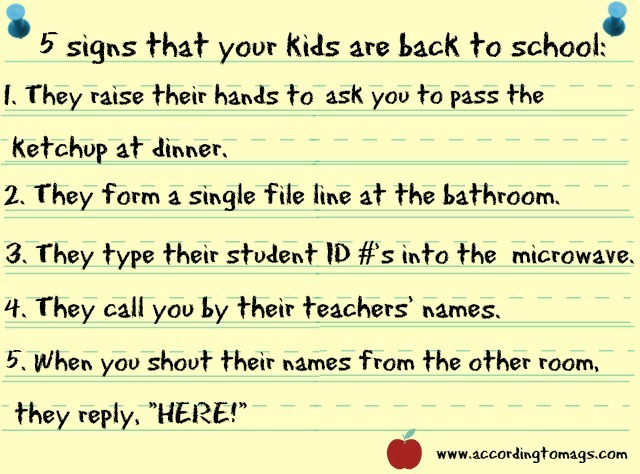 At the onset of this new school year our family finds ourselves adjusting to a new schedule. Coming off a summer where we spent almost all of our time together as a family, Melissa has gone back to work full-time and Maggie has started full-day Kindergarten. Our weeknights are filled with homework, piano lessons, scouting, and dance classes. All of these activities occupy the time we once spent together doing something leisurely. We’re all feeling the crunch and none more than little Maggie. Tucker is her best friend. He’s her protector, playmate, and confidant. He laughs at all her antics and comes to her aid when she’s been hurt. Tucker makes her feel more special than anyone else in the world. Maggie doesn’t know exactly how much less time she has with her brother each week but she feels the pinch. She can sense that it’s less and she misses him. She’ll say as much too, asking to go to Scouts with him or inviting him to come to dance classes with her. It’s like she knows she only gets to be this age once and that these young years with her brother are fleeting. Somewhere in her subconscious mind she knows that she needs to embrace every moment while they’re here; wisdom from the actions of a five-year-old. So it’s not surprising that her long-time comfort items, her Silkies, are sharing some space. Maggie has found something new to make her feel warm, safe, and secure. For Christmas Tucker received a fleece, camouflage robe. He wore it after showers during the winter months. When the weather got warmer he hung it on the closet door knob. There it sat, blending in with the rest of the room, until Maggie claimed it as her own. She still calls it “Tuckie’s Robe” but for all intents and purposes it now belongs to her. She sleeps with it curled around her every night. She wears it every morning for breakfast. In the evenings she wraps herself in it, disappearing in a heap of green. To her, the robe is a reminder. 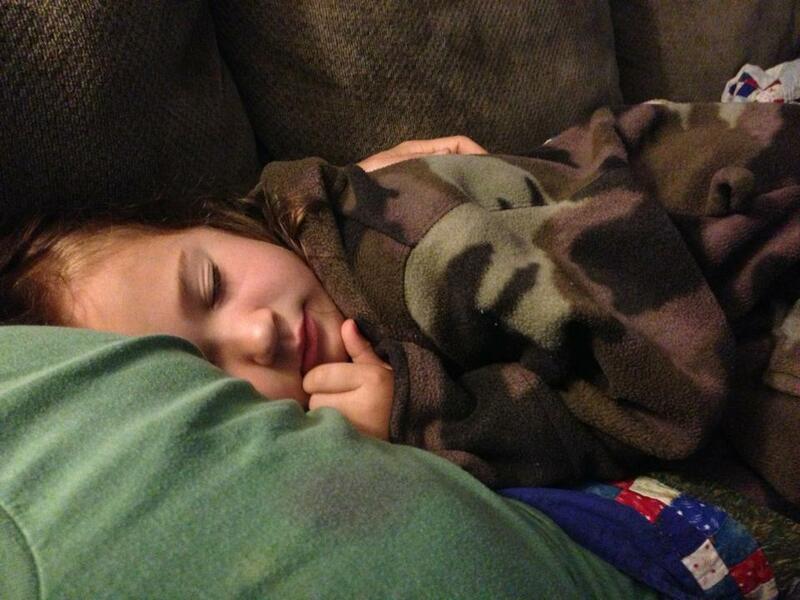 It’s a way to wrap himself around her to provide all the comforts her big brother offers even when he’s not there. The robe connects her to him, keeping him close at all times. To me, the robe is a symbol of the bond the two share and of the relationship they’ve built. It’s a testament to good times and happy memories. It’s also promise of many more to come. We should all be so lucky as to have a camouflage robe of our own. Me: "I can't believe the Bills are winning right now." Chris (the lifelong Bills fan): "Don't worry. There's ten minutes on the clock. That gives 'em plenty of time to screw this up." Bills vs. Pats. Boys vs. Girls. Twice a year we bring out our game faces. Sounds intense, right? Nah. Not really. We do it in jest...and take dorky pictures of ourselves. I looked back tonight over the past few years. I knew exactly which year each had been taken based on our faces. Top left (no, your other left) was obviously during a time I was sleep deprived. One or both of the kids still weren't sleeping through the night. I looked T-I-R-E-D.
Bottom left (Hold your thumb and pointer finger up. It should form an L.) was taken to prove to my little man that once upon a time he cheered for the Pats. Bottom right (bottom...hehehe) it looked like I had slept a little and was having a good hair day. 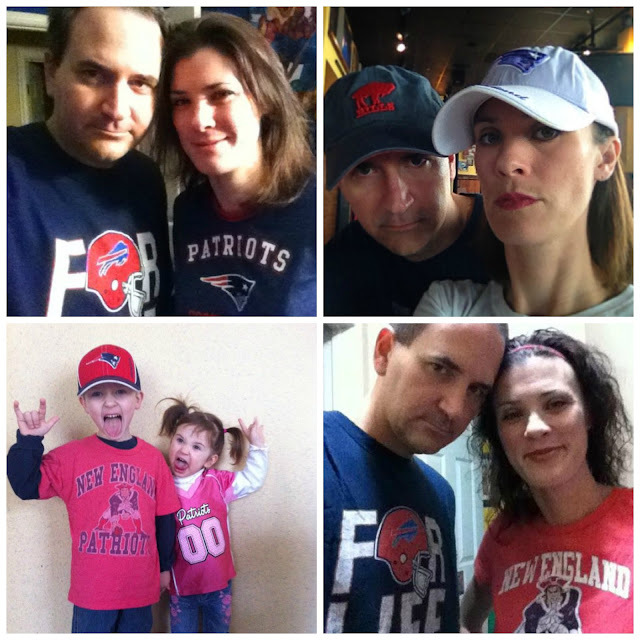 Top right (hey, you got it) I couldn't find any of my Pats gear this morning. Both my shirts and sweatshirts were nowhere to be found. Doesn't that sound suspicious to you? Luckily, I had my purple Pats hat my dad bought me. But I'm still on the lookout for my lost or "misplaced" sports attire. Here's to a great football season! Me: "How was your day, Mags?" Me: "That sounds excellent. How about you Tuck? How was your day?" Me: "No other details about your day? Just, "Great?"